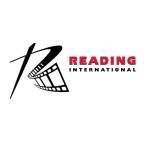 SAN DIEGO–(BUSINESS WIRE)–Reading Cinemas, a cinema brand of Reading International, Inc.
Digital 3D, immersive Dolby Atmos sound, and convenient reserved seating. largest commercial movie screens in San Diego. color technology for the clearest digital 3D experience. for guests of all ages. and live theater assets in Manhattan and Chicago in the United States. the Securities Exchange Act of 1934 (the “Exchange Act”). which are available on the SEC’s Web site (http://www.sec.gov). release, or to reflect the occurrence of unanticipated events.